The worst job interview advice I ever got was: ”say, YES to everything”. It was advice I got from my father. Now, my father gave me a lot of advice – and much of it good. But, this was not good. Of course, he was from the Depression Generation. You know, those folks who grew up in America when 1 out of 4 people were out of work, and if somebody asked if you could operate a drill press (whatever that is), you said YES. You needed a job, dammit. So, you said yes. Then you will either injure yourself, another or get fired. I’m sure there are folks out there – even a few of them who are still around from the Depression Generation – who will tell you stories of how they bluffed their way through a job interview and got on the job and figured out how to do whatever it was they said “yes” to and really didn’t know how to do at all. While all of these stories are exaggerated, some will actually be true. The problem is there is no balance with the stories of people who lied on a job interview and then got fired on Monday morning. There are lots more of these stories; it’s just that nobody tells them. So, here’s my advice. Don’t take my father’s advice – not this time, anyway. 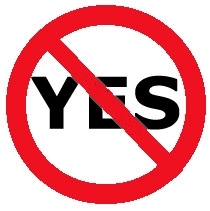 Say No if it’s No and Yes only if it’s really, YES!